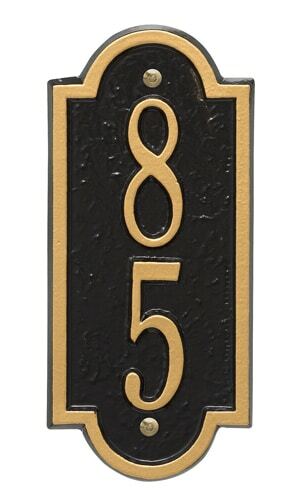 A vertical address plaque can be installed on your curbside mailbox post, as an address lawn marker, or attached to your home as a vertical wall address plaque, depending on your preference and the architectural style of your home. 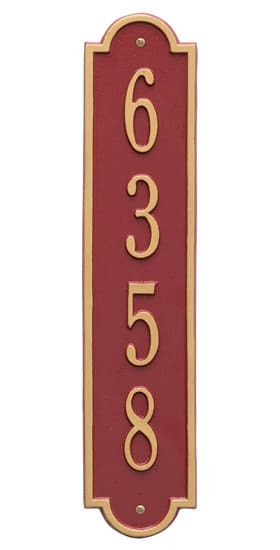 For added visibility, The MailboxWorks also carries vertical illuminated address plaques, reflective house numbers (up to 4” high), and an optional solar powered lamp to illuminate your house address numbers at night. 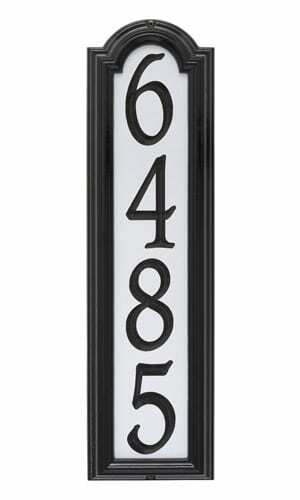 The solar lamp automatically turns on at dusk and turns off during the day. 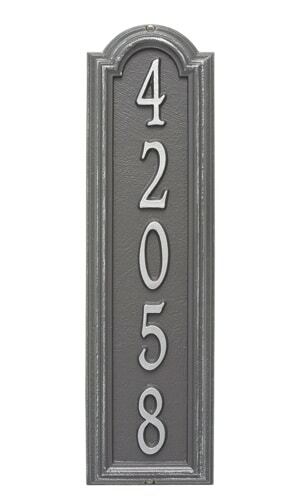 To further compliment your home’s décor you can also choose a vertical house address plaque in various colors made from cast aluminum, solid brass, slate, granite, or crushed stone. 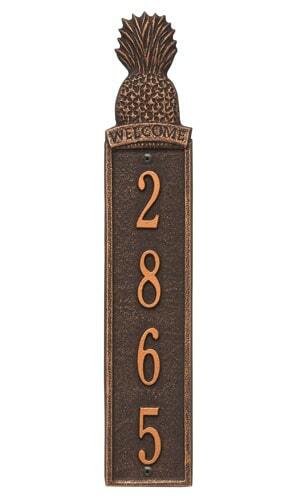 There are so many choices available you are sure to find what you want. 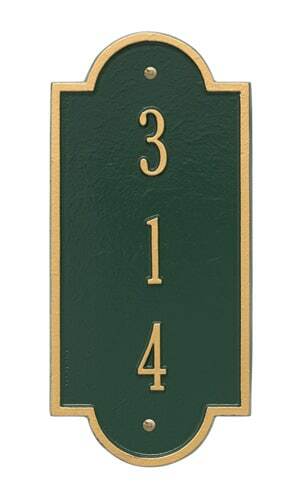 If you still have questions or need help choosing a vertical address plaque, call The MailboxWorks toll free at 1-866-717-4943. 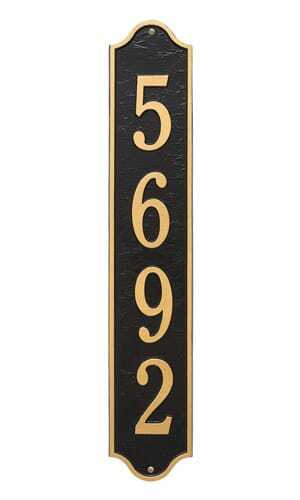 Shop for house address numbers at The MailboxWorks and choose from our wide selection of vertical address plaques for sale by top manufacturers like Whitehall Products, Stone Mill, Majestic, and Qualarc. 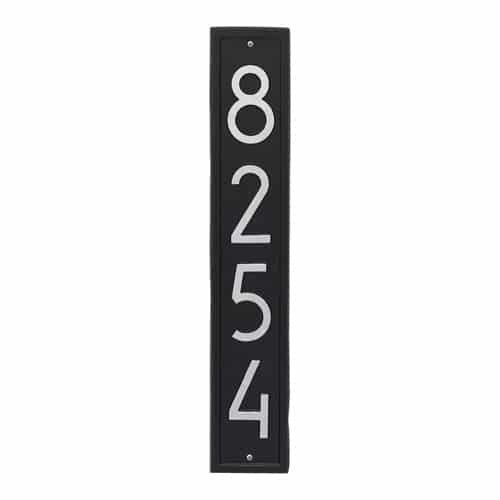 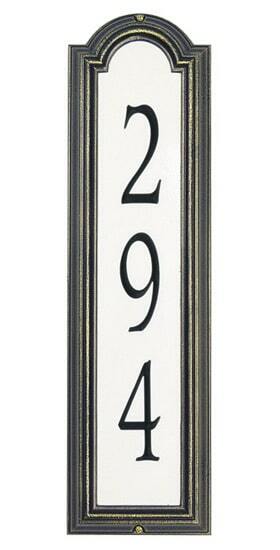 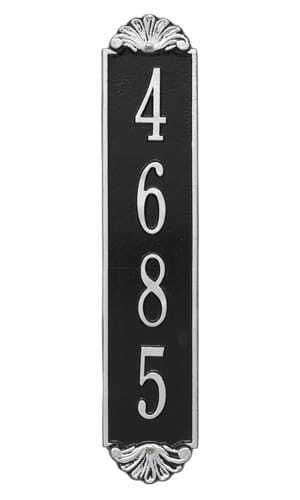 Whitehall vertical address plaques come in various sizes depending on your installation requirements, and both Whitehall and Majestic offer several options for reflective house address numbers. 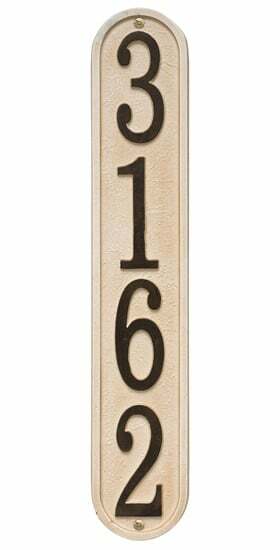 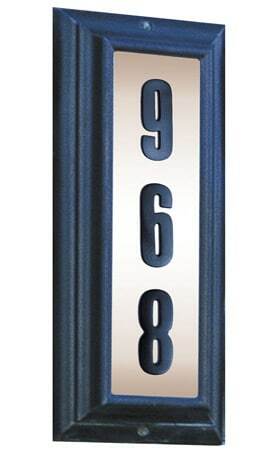 For vertical lighted house numbers check out the Qualarc Edgewood model, or consider adding the optional solar lamp above your new vertical address plaque. 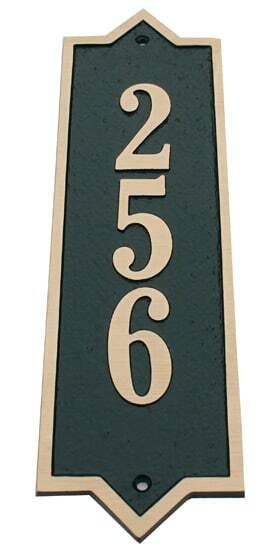 For clear identification, every vertical address plaque contains just the house address numbers (no street name or resident’s name). 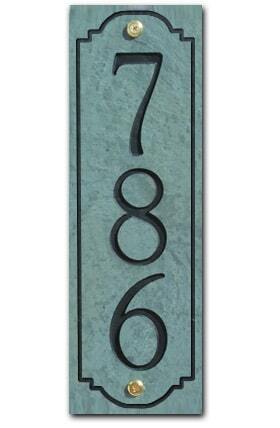 If you want a more customized look, Stone Mill vertical address plaques are made in the USA and are hand cut from newly quarried slate or granite. 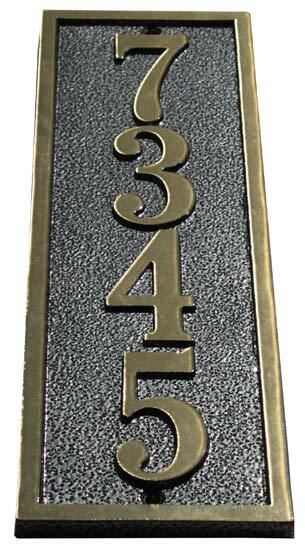 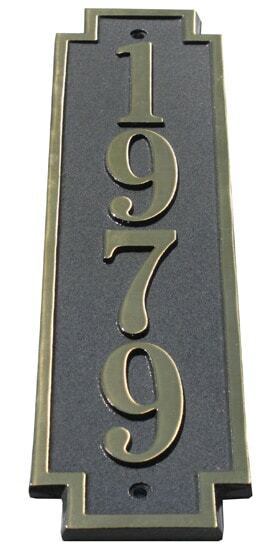 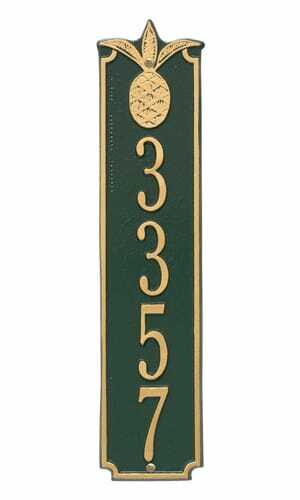 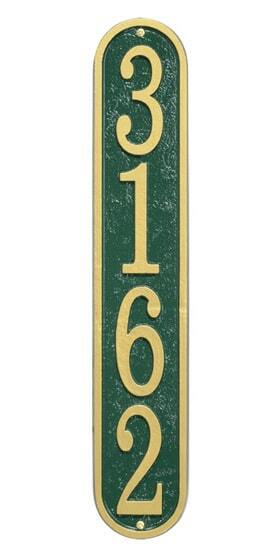 Most vertical address plaques and lawn markers come with the mounting hardware you’ll need for installation. 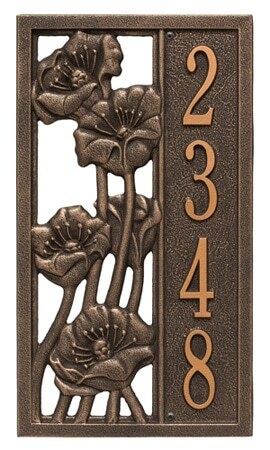 We also offer free shipping and there’s no tax for customers outside of Illinois. 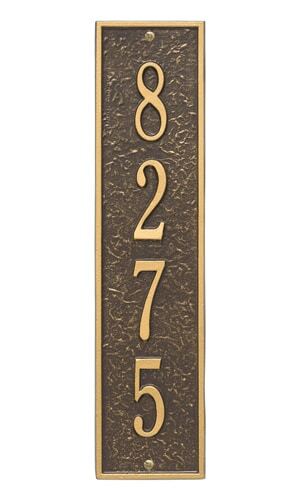 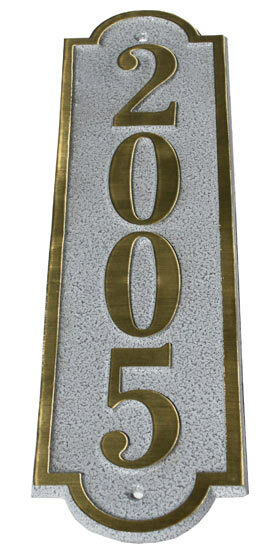 Ask us about personalizing the design and numbering of your vertical address plaque of choice. 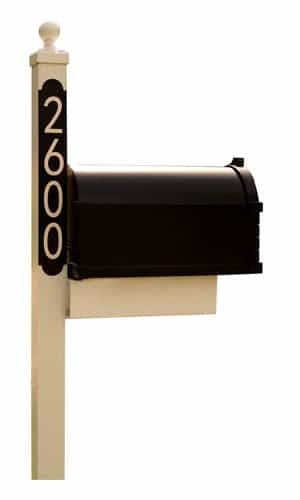 Call The MailboxWorks Toll Free at 1-866-717-4943 for assistance in ordering any of our vertical address plaques or use our “online chat” option.